The first RMH was built in 1977 in Philadelphia USA. A young girl called Kimberley was a patient in the local children’s hospital, getting treatment for leukaemia. Her parents spent a lot of time at her bedside. Kimberley’s dad was a Philadelphia football player whose team manager (Jim Murray) saw how tough it was for the family not having somewhere they could stay very close to the hospital ward and Kimberley. Dr Audrey Evans, Ray Kroc from McDonalds and Jim Murray, got together to make an incredible thing happen – they secured premises and funding and opened the very first Ronald McDonald House and started something that was to eventually help millions of families across the world. Here in Liverpool we had our very own inspiration, Lady Jean Stoddart, who was already heavily involved with Alder Hey Hospital. Lady Stoddart, seeing exactly how much difference to recovery could be made by having a child’s parents very close by, approached McDonalds UK and the RMH Charities organisation, about building a house at Alder Hey. Lady Stoddart became the Chair of the Alder Hey Family House Trust and was our President for many years until her death in February 2018. With funding provided initially by the Alder Hey 75th Birthday Appeal, Ronald McDonald House Liverpool (Mac House as it is affectionately known by our families) opened its doors on 7th May 1993, with just 26 bedrooms. Very quickly it became obvious that the house was not meeting the demand for rooms, with a waiting list every night of anxious families trying to stay close to their child in hospital. Following a big fundraising campaign, £2.2m was raised, including a contribution to building costs from McDonalds and Alder Hey, and in 1999 “RMH2” was opened, adding another 35 bedrooms and bringing the total to 61. As the House developed and family support services were added it was again clear that there was a real need to add something that reflected a growing need for longer stay facilities to help support families were a seriously ill child was receiving longer term specialist care at Alder Hey. 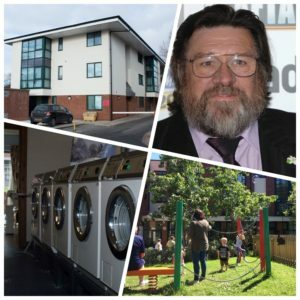 In October 2011 15 family apartments were opened thanks to a £1m donation from actor and comedian, Ricky Tomlinson and £500,000 raised by families. These apartments provide a lounge, bedroom, bathroom and kitchen facilities, offering privacy and a degree of normality via their own front door. With space for 84 families, Ronald McDonald House is the largest house of it’s kind in Europe. Our team of staff are a hugely dedicated bunch of people, aided by wonderful volunteers, all working to keep families together as a child goes through treatment at the hospital. More here about the many ways to help us with our fundraising !